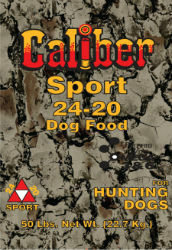 Sporting formula for hunting dogs. Meat Protein! No Soy, No Midds, No Fillers! Pork Meal, Ground Whole Grain Corn, Ground Soft Wheat, Chicken Fat, Chicken By-Product Meal, Brewer Rice, Corn Gluten Meal, Dried Beet Pulp(sugar removed), Flaxseed, Salt, Potassium Chloride, Calcium Carbonate, Hydrated Sodium Calcium Aluminosilicate, Choline Chloride, Ferrous Sulfate, Vitamin E Supplement, Zinc Sulfate, Zinc Oxide, Manganese Sulfate, Copper Sulfate, Sodium Selenite, Niacin Supplement, Biotin, Calcium Pantothenate, Vitamin A Supplement, Riboflavin Supplement, Menadione Sodium Bisulfite Complex, Thiamine Mononitrate, Vitamin B12 Supplement, Calcium Iodate, Pyridoxine Hydrochloride, Vitamin D3 Supplement, Cobalt Carbonate, Folic Acid.